Gorge Grown Food Network could not exist without its many amazing volunteers. If you would like to consider helping GGFN, please fill out the form below and our volunteer coordinator will reach out to you soon. We look forward to working with you! Gorge Grown manages the Hood River Farmers Market, Mosier Farmers Market and Mercado del Valle in Odell. – Parking lot attendee: keep traffic moving and parking available, an essential market task! 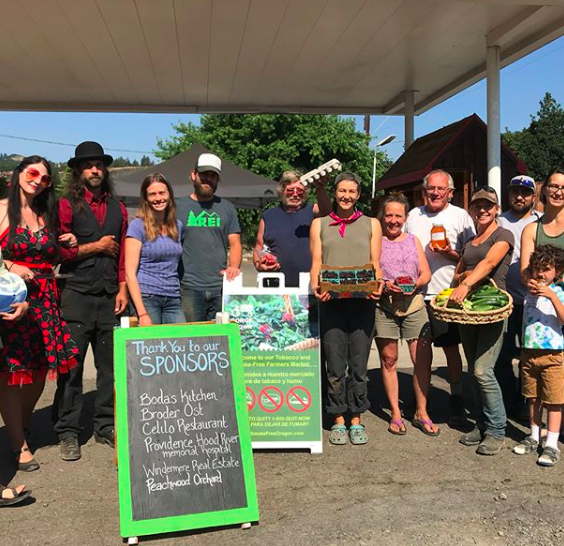 The Mobile Market brings fresh produce to communities throughout the Gorge. Find a schedule here. Our volunteers help harvest excess produce from local farms and orchards to donate to food banks and those in need. – Help distribute Gorge Grown event posters, Buy Local campaign materials, at other information to area hot spots. – Volunteer at a farmers market near you. Find more info here. – Lend a hand at a school or community garden. Do you have another idea? Connect with us! Fill out the interest form below.